Christ Church (109th & Yale - Tulsa) is fortunate to have among us Dr. Virginia Glandon, Professor Emeritus, University of Missouri, Kansas City, specialist in Irish History. On Wednesday, February 1, (The Feast Day of St. Brigid), Dr. Glandon will present a program on the life of St. Brigid, as she worked to convert the Pagan Celts to Christianity. Other topics to be addressed include: the founding of the monastic order; her great compassion for the poor; her continuing influence around the world; and the myths and legends that surround her name. The evening will open with refreshments as we gather at 6:30 p.m. and then settle in at 7:00 p.m. to be enlightened and enthralled with the information Dr. Glandon shares. If you have questions, please email or call the church office. The Church's email is christchurchtulsa@sbcglobal.net , and the phone is 918-299-7510. St. Bridgid was probably born in a small Irish village named Faughart about the year 450 A.D. St. Patrick, with whom she developed a close friendship, baptized her parents. According to the stories written about her, Bridgid's father was an Irish chieftain of Leinster, named Dubtach, and her mother, Brocca, was a slave at his court. She grew up with very high spirits and tender heart tender toward God and the poor. As a child, Bridgid heard Saint Patrick preach, which she never forgot. She could not bear to see anyone hungry or cold, and to help them, often gave away things that were Dubtach's. When Dubtach protested, she replied, "Christ dwelt in every creature". Dubtach tried to sell her to the King of Leinster, and while they bargained, she gave a treasured sword of her father's to a leper. Dubtach was about to hit her when Bridgid explained she had given the sword to God through the leper. The King, a Christian, forbade Dubtach to strike her, saying "Her merit before God is greater than ours". Dubtach solved this domestic problem by giving Bridgid her freedom. Can you imagine, risking physical punishment to care for the homeless, the sick and the needy? Quite an eye opener, for me. Some years later, her father, arranged a marriage for her with a young man. Bridgid refused, and to keep her self devoted only to the Lord, she went to the local Bishop, Mel. He was a pupil of Saint Patrick's, and she took her first vows as a Nun. She was a beautiful young woman, and there are stories that she prayed that her beauty be taken from her so no one would else seek her hand in marriage. What a sacrifice, how often vanity invades our life, and here is one avoiding it in such a fundamental way! There is another story that says that when Saint Patrick was hearing her final vows, he mistakenly used the form for ordaining priests. When a man pointed this out to Patrick, he replied, "So be it, my son, she is destined for great things." This is one reason why the ancient Church of Ireland had a great deal of equality between women Abbesses and men Bishops. So unfortunate that equality has only recently been rediscovered. 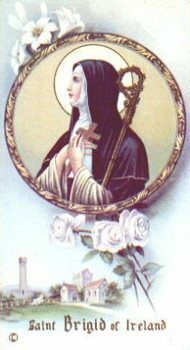 Bridget was one of the most amazing women of her time, and despite the numerous legendary, often fantastic miracles attributed to her, there is no doubt of her deep spirituality, her boundless giving and compassion for those in distress. She died at Kildare on February 1, 525 A.D.
Everliving God, we rejoice today in the fellowship of Your Blessed servant Bridgid, and we give You thanks for her life of devoted service. Inspire all of us with life and light, and give us perseverance to serve You all our days; through Jesus Christ our Lord, Who with You and the Holy Spirit lives and reigns, one God, world without end. Amen. My younger brother has survived his time in ICU. It was absolutely terrible how he suffered in great pain. Friday he gripped my hand and begged me to help him die. No one should hurt so bad. Thank God he is now much improved, and can not remember much of that time. I wish I couldn't remember it as well. There certainly are worse things than dying. His kidneys continue to improve, and he can now talk to us pretty well, and he is in his own room, for which I am grateful. I am spending the day trying to get letters from Doctors to help him with his Social Security Disability and to get him on Hospice. It has been amazing to me how the prayers of my Novena to St. Jude has tracked the events surrounding this whole process. 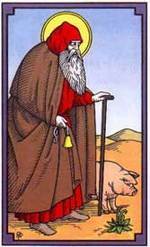 It has been a strong comfort and guide during this this time. 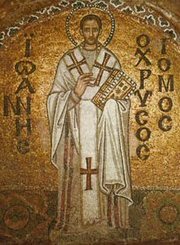 Today is the feast day of St. John Chrysostom. John was called "Chrysostom" ("Golden Mouth") because of his eloquence, and one of my favorite Saints. John was born in 347 in Antioch, Syria and was prepared for a career in law under a famous teacher, Libanius. Libanius was amazed at his pupil's eloquence and predicted a brilliant career for his pupil as statesman and lawgiver. 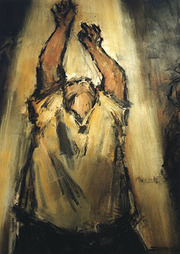 But John decided, after he had been baptized at the age of 23, to abandon the law in favor of service to the Savior. That alone is remarkable, how many of us with brilliant careers before us, forsake our college education for simple service to Jesus? I actually know a couple, and they are radiant stars for Jesus. He became a preacher there in Antioch, and was such a spellbinding minister, that people were warned about taking large sums of money when they went to hear him speak, since thieves discovered it was easy to pick the pockets of his hearers, because they where listening so intently!! He eventually became so famous that the Empress Eudoxia (Emperor Arcadius) at Constantinople decided that she must have him for her court preacher, not because of what he said, but because he was so popular. So, at 49, he was duly elected as Patriarch of Constantinople, which was one of the most prestigious post in all of the Empire. He promptly used his position to launch a crusade against corruption in high places, licentiousness, and extreme wealth. When a silver statue of Eudoxia was erected near his cathedral, John compared her to Herodias. This was not received well. The Empress considered this a personal attack on her and her royal court, which it almost certainly was. There was a strong reaction, and he was sent into exile. The humiliation of the exile did not stop St. John, who continued to write to various parts if the Church until he died in the lonely north-eastern province of Pontus in 407. The skinny, five-foot St. John stood tall in his defiance of State authority, bowing only to God and never yielding the high principles of Christianity to expediency or personal welfare. I think about that, what would that be like in modern times? It would be as if say, Billy Graham was brought to Washington to preach to the President, and he did not like what was said? Would Rev. Graham (or whomever) be able to resist the most powerful person on the planet? What if real jail time was involved? Standing up for Jesus when facing REAL threats from people who can fulfill those threats is definitely a frightening prospect. Historically our system of Government didn't lend itself to that analogy, but it is a close as I could come. John had a great effect, though long past his life. 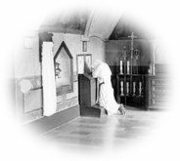 Every day in the Daily prayers of the Church, a phrase he composed is used: "Fulfill now, O Lord, our desires and petitions as may be best for us". What a wonderful statement of faithfulness to Jesus, asking not for what we want, but for what is best for us. This constantly causes us to refocus our selfish minds on God, rather than ourselves. This phrase has been running through my mind over and over as my brother begins what seems to be his final journey on earth. O God, who gave to Your servant John Chrysostom grace eloquently to proclaim Your righteousness in the great congregation, and fearlessly to bear reproach for the honor of Your Name: Mercifully grant to all bishops and pastors such excellency in preaching, and fidelity in ministering Your Word, that Your people shall be partakers with them of the glory that shall be revealed; through Jesus Christ our Lord, Who lives and reigns with You and the Holy Spirit, one God, for ever and ever. Amen. Today's focus in the Novena is a commitment to having greater confidence and faith that God's will be done in this situation, something that can be hard to release. My brother survived emergency surgery yesterday and is now hanging on in ICU with a respirator. Today could very well go one way or the other, and I am committed to submit to God's will in the matter. Trappist Monk Fr. Thomas Merton's words are a great comfort to me now. "We do not see the way that lies ahead of us. It seems dark, but God is the Master of all destinies and His will is love. Let us then put aside everything else and trust ourselves completely to Him, giving ourselves to His love, asking Him to enlighten and guide us in the way of positive action, if any such action is feasible. For the rest, we must have great patience and sustained fidelity to His will and to our ideals." I continue my prayers and ask St. Jude, my Priest & Parish as well as other friends to join with me. Tomorrow, Jan 25 I begin, along with some friends, a spiritual discipline called a Novena. In this case it is a nine day set of prayers, scriptures and assocaiated actions with the intention of healing for my younger brother. This Novena to St. Jude is to start on Wed. Jan 25 and end on Feb 2 the Feast of the Presentation of Jesus in the Temple. For many years St. Jude has been the Patron of lost or desperate causes, when all else has failed, the Brother of the Lord has been a sure and certain friend to those who have little hope left. I am also planning on doing a Rosary and vigil before the Blessed Sacrament during the middle of the Novena. I have no words to tell you how desperate the situation is, and how the time appears to be growing short. I don't know that things can continue much longer as they are. St. Jude himself tells us to persevere and not to lose sight of the mercy of our Lord Jesus Christ. I can only hope that his prayers joined to ours are granted as God would deem best for my brother as well as all of us. Most holy Apostle, St. Jude, faithful servant and brother of Jesus Christ, the Church honors and invokes you universally, as the patron of hopeless cases, of things almost despaired of. Pray for my brother, he is so helpless and alone. Make us I implore you, of that particular privilege given to you, to bring visible and speedy help where help is almost despaired of. Come to his assistance in his great need that he may receive the consolation and help of Heaven in all his sickness, pain, and sufferings, so that he may praise God with you and all the elect forever. Someone sent THIS to me as a joke, and at first I thought it was awful and weirdly funny, then I realized why I didn't think it was all THAT funny. 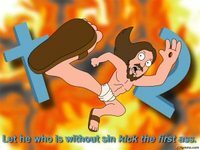 You see, I recognized the Jesus in this video, he is the Jesus of the American Political Right Wing, the Jesus of well to do South Tulsa, the Jesus that too much of the world sees in what is portrayed as Christianity these days, not the Suffering Servant, the Jesus of the Gospels, the real Jesus that Christians of every tribe and nation know. Sometimes people make jokes that are a little too close to home. The confession that Jesus is the Christ, the Son of the living God, was given to an unworthy human being - Peter, a regular person, just like you, and me. That reality is the rock on which Jesus has built His Church. When we confess that Jesus, true God and true man, is our Lord, the power of God Himself is with us. All of our sin, our failures, the wrongs we have done, the things we have left undone no longer have power to condemn us. Jesus has blessed us with the sure and certain hope of resurrection where the gates of death can never prevail against us. He, Jesus, the Messiah has entered the world, once for all. It is funny how the cycles of the Church Year so connect with our everyday lives at times. Just last night some friends and I were discussing how before Constantine, being a Christian was dangerous, unpopular, and joining the Church was difficult and only for those most committed. Constantine made becoming a Christian popular, politically astute, and being part of the culture you were born in, it no longer carried the risk it once did. After the Emperor had changed Christianity from a despised, persecuted sect into the main State Religion, many sincere Christians felt the need to make more of a commitment to the service of Christ, than the State Church offered, and their longing resulted in the beginnings of the Monastic tradition. Could this be similar to the "Emergent" Church today? This trend had begun before the conversion of Constantine and the changes in Church life that came with it, and was strongly reinforced by the new reality. Men chose seek Christian commitment by leaving their homes and the society they knew, going into the desert, and becoming hermits, devoting themselves to solitude, fasting, and prayer. Antony of Egypt, often mentioned as the founder of Christian monasticism is one of the great examples. As Athanasius tells us, about six months after his parents death, Antony stopped in a Church and heard the Gospel of Matthew 19:21 being read, "If you wish to be perfect, go and sell what you own and give the money to the poor, and you will have treasure in heaven; then come, follow Me." It just so happened that on the way to Church that day, Antony had been mediating on this very verse and after hearing it again, he felt this was directed at him personally. So Antony did what so few of us do, he provided for the care of his sister, he gave his land to the tenants who lived on it, gave his other wealth to the poor, and became a hermit (Monk). Antony lived alone for twenty years in the desert, praying and reading, and doing manual labor. Somewhere around 305, he gave up his solitude to become the head of a group of monks, living in a small cluster of huts or cells, devoting themselves to communal singing and worship, to prayer and study. All of this was done under Antony's direction and guidance. They did not totally abandon those they left behind, being very careful to pray for their fellow Christians, and working with their hands to earn money so that they could give it to the poor. 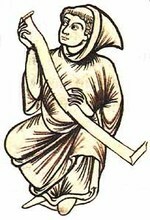 In spite of the weakness of his physical body, Aelred determined to bear cheerfully greatest disciplines of the Cistercian Order. He spent much of his time in prayer, reading, and studying. His heart was so focused on the love of God that he said that it made him feel tha all the Cistercian austerities were sweetness and light. Towards the end of his life, ill-health forced Aelred to live in a small hut near the infirmary at Rievaulx. He could hardly travel anymore but once in a while was able to visit his friend, St. Godric, while he was traveling north to oversee the Scottish foundations of his Order. Aelred died on 12th January 1167 and was buried in the Chapter House at Rievaulx. Although, he was never formally canonized, a local following, approved by the Cistercians grew up around him, and he remains a popular English Saint.